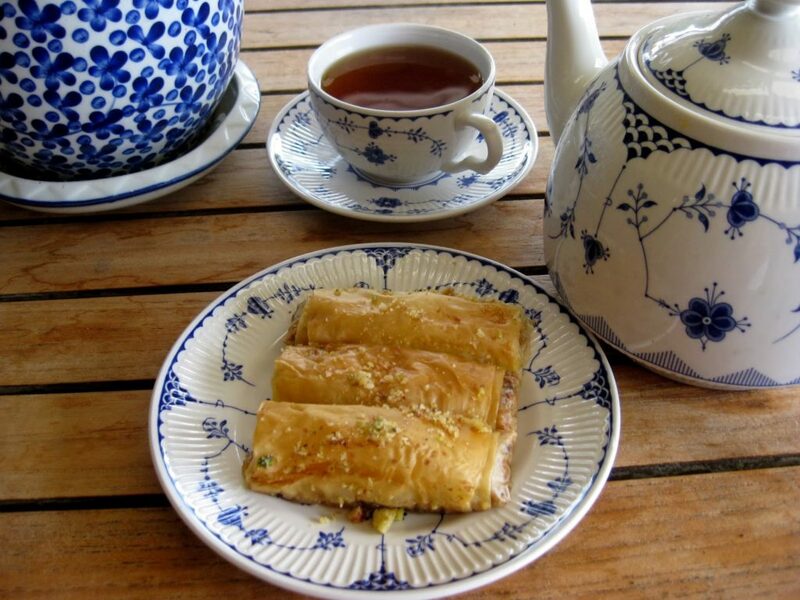 Strictly speaking, the heading should be Middle Eastern and Mediterranean nut pastries for you will find these tasty little filo pastry treats in every cake and coffee shop from North Africa, through all parts of the Arab speaking world, Israel and around into Greece. 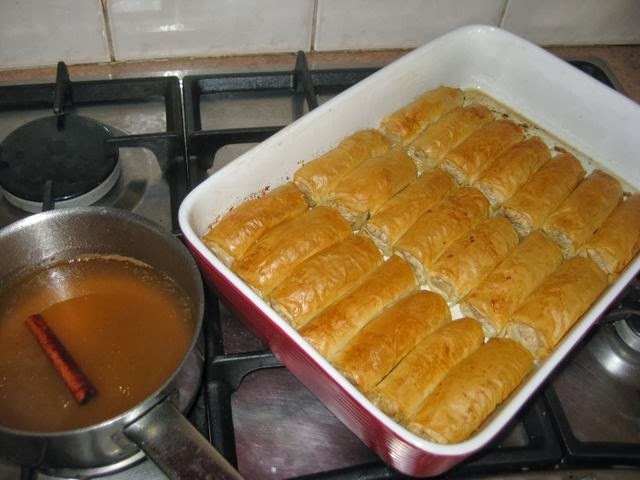 Migrants to our shores, from the old Ottoman empire, have brought with them all kinds of fabulous food and baklava is one of them – unfortunately we usually get a poor version of it with, heaven forbid, peanuts! In baklava’s homelands they are always made with pistachios, walnuts and almonds – separately, or a mixture of any of the three. 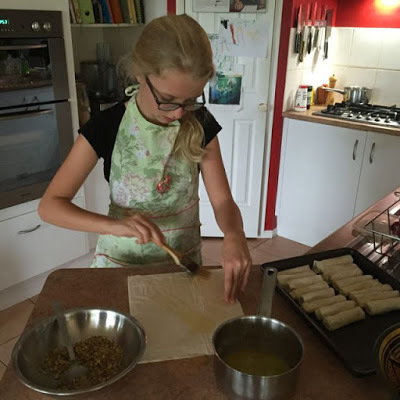 Baklava is the generic term for these sweetmeats that come in all shapes and sizes, with local variations on the basic recipe – I just like making the cigar shaped ones based on a Greek recipe – they are easy to make, store and serve up. Their lemony tang takes the edge off the sweet syrup. Baklava is actually a Farsi word (the Persian language of Iran and Afghanistan) for ‘many leaves’ and, if you have eaten them, you will know why. Nuts and honey, along with a wide variety of vegetables and olive oil are also an integral part of the nutritious and healthy traditional Mediterranean diet. 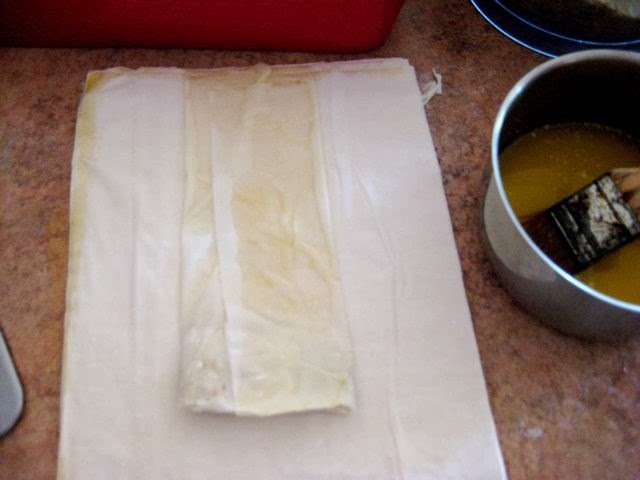 1 pack filo pastry, with the sheets cut in half. 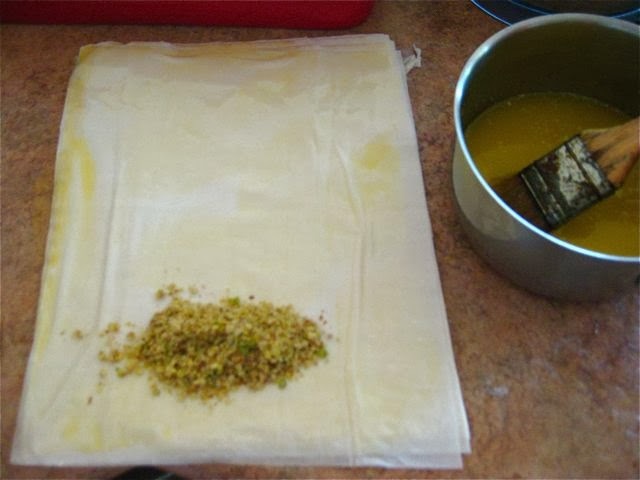 Reseal the unused sheets and store in the fridge – they will keep for another couple of weeks and can be used to make cheese and spinach pie, more baklava or some tasty savoury triangles. Filo pastry is very versatile. 300g mixed whole pistachios, walnuts and almonds that have been toasted in the oven on 180oC for ten minutes. 3. Pulse nuts in food processor until roughly chopped and size of large breadcrumbs. NOTE: Don’t over-pulse the nuts of they will go oily. 4. 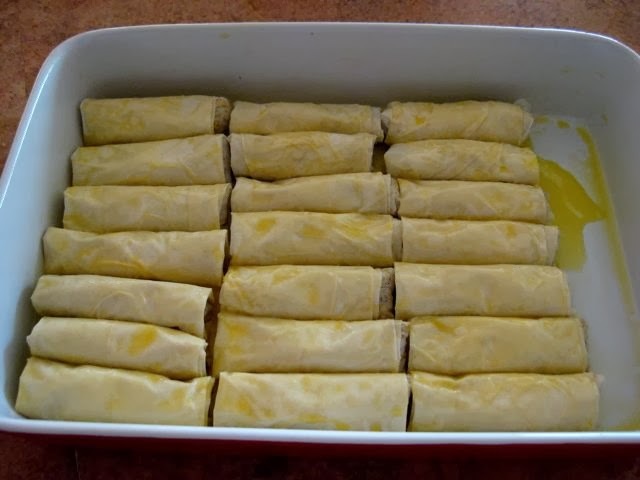 Cut filo pastry in half. 5. 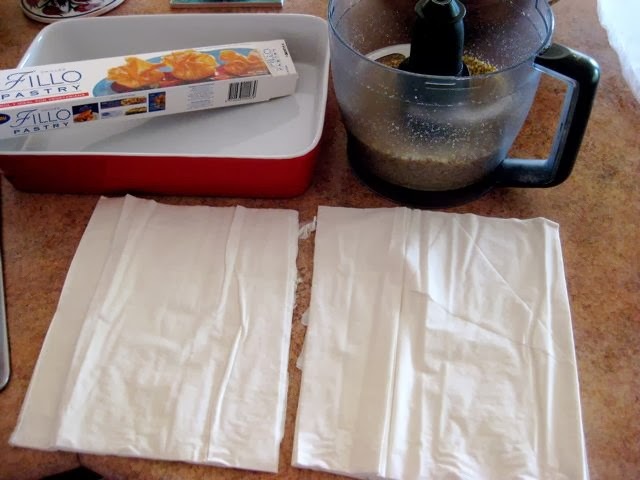 Brush top sheet of pastry with melted butter. You will brush every subsequent sheet in the same way. 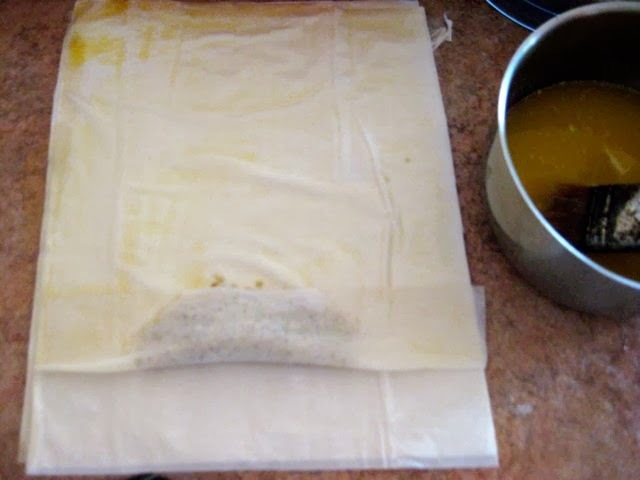 NOTE: Place the filo sheets on a dry bench, otherwise you will make the same mistake I made once and the bottom few sheets of pastry disintegrate before you get to them. 6. Put one desertspoon of nuts in the middle of the bottom of the sheet – about 5cm from the edge of the sheet. YOU WILL ONLY BE USING ONE SHEET AT A TIME. 7. Fold up the bottom edge over the nuts. 8. Fold the left side over the nuts, and then the right. Roll up into a cigar shape and start placing them in your greased baking dish – seam side down. 9. Pour over the remaining melted butter and you should have something that ends up looking like this. Place in oven on 180oC for 20-25 minutes until puffed up and golden. Dear reader, you are having the benefit of my previous ‘experimental’ batches of odd shaped baklavas that usually involved bits of nuts and filo all over the floor. 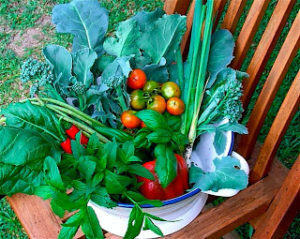 This is easy once you get the hang of it – I actually find it quite therapeutic – you just need a clear bench top, a clear head and a bit of time. 10. While the pastries are baking, make the syrup. Put all the ingredients together in a saucepan and simmer for about 20 minutes. 11. When the pastries are cooked, strain the syrup over them. When they are cool, I store them in sealed plastic boxes in the fridge. They seem to keep until we have eaten them all – which is not very long! 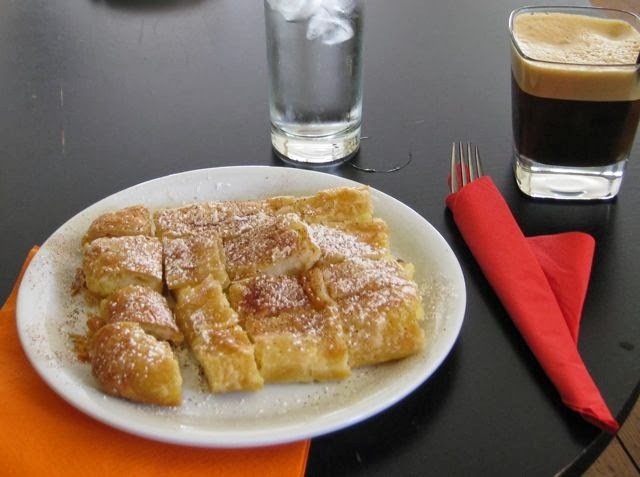 Bougatsa – another Greek filo pastry treat that I am mildly addicted to. These are usually warm when you get them and filled with a lemony flavoured, sweet curd cheese called mizithra, similar to ricotta.